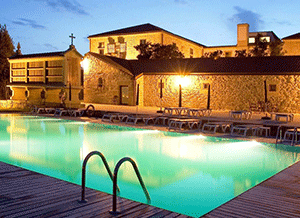 Treat yourself to the best accommodation on the Portuguese Way with CaminoWays.com’s new Superior Collection. Following the success of the French Way Superior Collection, CaminoWays.com, the walking and cycling holiday specialists, have unveiled a new Superior Collection for the Portuguese Way, the second most popular Camino route. This fantastic new collection features some truly spectacular accommodation options including classic Galician manor homes called “pazos”, welcoming country cottages and beautiful heritage properties such as ‘paradores’. Those who choose to avail of this great collection will start their journey in the town of Tui, where they will stay in a fantastic 4-star parador, before venturing to Pontevedra city where they will rest in the fabulous 16th century Renaissance Palace of the Counts of Maceda. From here, walkers will make their way to Padrón where they will stay in the unique setting of Pazo de Lestrove, a historic country home. Finally, the journey will end in stunning Santiago de Compostela where pilgrims will stay in the 5* Parador dos Reis Católicos, ones of the oldest hotels in the world, which was opened to welcome pilgrims over 500 years ago. Your Superior Collection Camino de Santiago holiday on the Portuguese Way from Tui to Santiago de Compostela, staying at the best accommodation available. 7-night Portuguese Way Superior Collection Camino de Santiago holiday from Tui to Santiago, starting from €863pps. Travel dates: All year round. Includes: Accommodation on a half-board basis in the best properties available on the Portuguese Way Camino de Santiago (depending on availability), luggage transfer, holiday pack. Does not include: Flights, airport transfer (optional), insurance, dinner on first or last night. Price is subject to availability. Hi we are 3 lady friends hoping to walk the last section of the Portuguese way in May 2015. Can you please give approx price for 1 single room and twin room in Standard accommodation with meals and luggage transfer. I travelled with your company last May on French route and had a great experience. Hi Miriam, that’s no problem. We’ll get the customer care team to email you a price for those dates. The coastal way is not very hilly, you can see elevation here: http://caminoways.com/ways/portuguese-coastal-way-caminho-da-costa/portuguese-coastal-way-cycling (click on ‘itinerary’ tab to see the map and elevation). Let us know if you need any more information. Hi. Can you advise a price for a self-guided cycle tour, with upgrated accomodation, from Porto to Santiago de Campostella (coastal way) Are there some very hilly sections? We hope to travel in July, Aug or early Sept.
Hi Denise, no problem. The Customer Care team will be in contact with an itinerary. Kind regards. Way Superior Collection in mid Sept.2015. Hi Nikki, no problem. The Customer Care team will be in touch with suggestions. Kind regards.